There are many weird unknown scholarships for 2019, such as short people scholarships or the Oh, The Places You'll Go! scholarship from Dr. Seuss. Here are some ideas to get you thinking about creative ways to pay for college. Are you ready for the weird and unknown? Application Deadline I contacted Dr. Seuss and received this response: Thank you for contacting us regarding the Oh, the Places You'll Go! scholarship. Unfortunately, at this time, Dr. Seuss Enterprises will not be offering a scholarship in 2013. Check back for 2017 on their link at http://www.seussville.com/OTPScholarship/. When I was a child, I remember reading so many of Dr. Seuss children books. 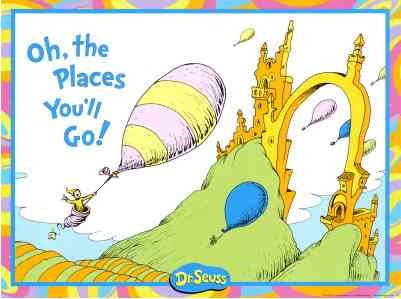 One of the most inspirational, and very appropriate for high school seniors as they enter college, is the best selling book Oh, the Places You’ll Go! By Dr. Seuss. So dust off your childhood books and read this classic, then apply for the Dr. Seuss scholarship. In 2010/2011 this was a writing scholarship, and in 2011/2012 an art contest, so we were eager to see what the Dr. Seuss scholarship requirements will be in 2012/2013. But alas, as we said above, at this time they will not be offering a scholarship. What a shame, as this was one of the fun but weird unknown scholarships for college, and one of the best scholarships for high school seniors. Application Deadline Applications accepted through late March or early April for high school seniors and tentative April – August for college/trade school students. Award Amount 10 $2000 scholarships for high school seniors and 5 $1000 “second chance” scholarships for those pursuing college or trade school. For this easy scholarship offered by the American Fire Sprinkler Association Scholarship Program, read their Fire Sprinklers essay and correctly answer 10 multiple choice questions. You can then enter to win the contest. Must be a US citizen or legal resident. High school seniors must enroll in college in the fall to qualify. For American Fire Sprinkler Association Scholarship Program information and online application see www.afsascholarship.org. Award Amount $5000 for grand prize, 3 $2500 second place winners and 3 $1000 runners-up. Create an imaginative presentation that discourages underage drinking, drunk driving or texting while driving. The presentation may be in any media, such as video, PowerPoint, essay, etc. The scholarship contest is limited to high school seniors across Western PA who will attend a 4-year college or university in the fall. For details see www.edgarsnyder.com . Short People Scholarships, offered by the Little People of America, is one of the weird unknown scholarships for college. Applicants must be 4 feet 10 inches or under to qualify as a member and apply for a short people scholarship. A short essay is required, and three letters of recommendation. Preference is given for those who have a medical condition that causes dwarfism. For more information on Short People Scholarships see www.lpaonline.org. It’s only fair that if there are short people scholarships, there should also be tall people scholarships. If your height is at least 5’10” for women or 6’2” for men, are under 21, and attending college for the first time in the fall, you may qualify for a scholarship through Tall Clubs International. For more information on Tall People Scholarships see www.tall.org. We can't all be tall or short, but we all know someone who is aging. This scholarship is for a high school senior or college student (2 or 4 year college) who is helping an aging relative, pursing a career that will impact the senior community, or works in the senior community. For more information on Aging Matters Scholarship see www.seniorcare.com/scholarship/. Another of the weird unknown scholarships for college is the Chick and Sophie Major Memorial Duck Calling Contest, associated with the World’s Champion Duck Calling Contest, held in Stuttgart, Arkansas. For more information on Duck Calling Scholarship Contest see http://stuttgartarkansas.org. Another of the weird unknown scholarships for college was the Scholar Athlete Milk Mustache of the Year, aka SAMMY awards. This program recognized the best high school athletes from grade 12. 2012 was the last year this scholarship was offered.